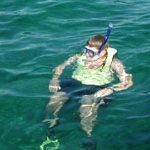 If you are thinking about snorkeling in key largo, you made the right destination choice because Key Largo and the Florida Keys have some of the best snorkeling in the world. I was able to spend a day with the outfitter, Sundiver, in Key Largo and explore the John Pennekamp Coral Reef. It was here that I learned what is required for snorkeling and the history or the marine sanctuary. My favorite part was learning about the hidden treasure under the sea by actually snorkeling the reefs. Since Key Largo is the biggest Key in the chain of Islands, you have plenty of choices there. From Activities like swimming with the dolphins in Key Largo, to hotels and restaurants. I definitely recommends Mrs. Mac’s Kitchen, the best lunch and Key Lime pie around. The Key West Inn is located near the boat dock, and is fine for accommodations. As for me, snorkeling my favorite activity and Key Largo is one of my favorite destinations in Florida. I made my reservations ahead of time and I always use Sundivers Station. They have been in Key Largo for long time and they treat you great. Upon arriving at the check in station at Sundiver Station, I noticed that they have display boards with interesting facts about the Coral Reef system off Key Largo. Key Largo was the first Marine Sanctuary of its kind. The recorded history of John Pennekamp says that in 1957 a biological conference concerned with the preservation of the natural resources of South Florida was held in Everglades National Park. At this meeting, Dr. Gilbert Voss of the Marine Institute of Miami described the extent of damage which was occurring to the reef structure that he had noted during his studies in the Keys. The tourist trade was taking its toll on the coral structures as souvenirs for visitors. Seashells, corals, sponges, sea horses, and marine life were being hammered, chiseled, and even dynamited to provide knickknacks for the tourists. The coral reefs that took thousands of years to form were quickly being decimated by thoughtless vendors. Dr. Voss then suggested that no more profitable scientific project could be undertaken except for the protection of this area. Without some restrictions on the exploitation of the reefs, commercial interests would easily extinct the only hard coral reef formation in North America. Dr. Voss successfully recruited conservationists to support his contentions that the reef should be protected, but his most powerful ally would eventually become an assistant editor for the Miami Herald, John D. Pennekamp. Pennekamp had played a major role in the establishment of Everglades National Park as legislative chairman of the State Commission appointed to bring it about. He was the first chairman of the Florida Board of Parks and Historic Memorials and a member of a civilian team of consultants which surveyed the U. S. Fish and Wildlife Service for the Department of the Interior in 1954. Pennekamp also held numerous state, local, and national conservation awards. When the two men joined forces they were able to utilize the research of Dr.
Voss and the journalistic effort of John Pennekamp to organize a coalition of conservationists that would undertake the project of protecting the valuable marine resources. The road ahead was not an easy one, but the efforts of Dr. Voss and Mr. Pennekamp were sufficient enough to get the Florida Board of Parks and Historic Memorials to designate a 75 square mile section of offshore Florida as a permanent preserve. For three years the advocates of the preserve struggled to win approval for the park, and successfully resisted all opposition from commercial interests that wished to leave the reefs open for pillage. In the spring of 1960, President Dwight D. Eisenhower proclaimed the area as Key Largo Coral Reef Preserve. By the time the dedication ceremonies were held on December 10, 1960, Governor Leroy Collins made a slight change and named America’s first underwater park as John Pennekamp Coral Reef State Park. Governor Collins named the park after John D. Pennekamp in appreciation of the continuous editorial support that had been given by Pennekamp in the Miami Herald. The key to successful snorkeling is relaxation in the water. It is as much a psychological as it is a physical skill. You will improve your skills and become comfortable in the water with practice. Here are some training tips. Put all your equipment on and practice floating in the face down and horizontal positions. Don’t swim; just calmly float. You can do this in shallow water or a swimming pool. To flood your mask, gently pull it away from your face and allow water to enter the mask. To clear it out, lift your head out of the water and tilt the bottom of the mask away from your face and allow the water to drain out. To flood your snorkel, immerse your head under the water until your snorkel fills up. Remember to hold your breath! To clear your snorkel, exhale a burst of air through your mouth to blast the water out. Then take a cautious first breath to make sure all the water is gone. In the water, objects look 25% larger (or closer) than they really are. You can practice judging distance by floating in very shallow water and reaching down to touch the bottom. This will help you learn how far an “arm’s length” is underwater. Walking with fins on can be uncertain on dry land or on a boat. If you are snorkeling from shore, try putting your fins on and removing them in waist deep water. If you are snorkeling from a boat, don’t put your fins on until it is time to enter the water and take them off at the boat ladder before getting back on the boat. To use your fins correctly, you must use an efficient kick. You can do this by using a slow flutter kick motion. Try to keep your knees and ankles relaxed to prevent your leg muscles from cramping. Once you are proficient in this skill, you will notice that your fins propel you through the water. You will hardly need to use your arms and can let them rest easily at your side, or keep one arm floating in front of your head to act as a bumper. Once you have mastered using your equipment, practice controlling your movements in the water. You will feel more comfortable and calm in the water as you improve your maneuvering abilities and you will minimize accidental bump-ins with objects in the water such as other snorkelers, reef elements, buoys, etc. Knowing your personal limitations is a vital skill often overlooked. Recognize them and remain aware of them. There is no good reason to push your limits. They will change with each snorkeling opportunity presented. Factors to consider are water temperature, surge, currents, and visibility. Your personal limitations will also change when you gain experience, get older, or have a change in health. 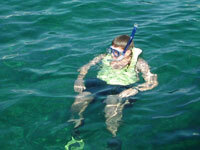 A relaxed snorkeler will get more pleasure out of snorkeling and a greater appreciation of the environment. A calm snorkeler seems less threatening and when the aquatic wildlife realizes you are not a threat, they resume their normal routine, allowing you to experience their world. Snorkeling Key Largo's Reef - Don't Touch! like Grecian Rocks, White Banks, Molasses Reef, and the very popular Christ of the Abyss. I was fortunate. The day I was there the weather was beautiful and the conditions just right. Nevertheless, the Sundiver crew made it clear they would not go out if the conditions were not right. This day at Grecian Rocks the fish were plenty and the reef was vibrant with colors. Hopefully, the pictures here will demonstrate the experience better than words can describe. 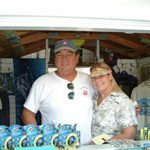 You can see why Gerry and Kathie, the owners of Sundiver, have been so successful in this business for the past 25 years. You can’t go wrong snorkeling with them. They don’t miss any details and are always concerned with your safety. They maintain a clean and safe boat. It is one of the few snorkel boats where the dive platform is level with the ocean, with very easy entry into and out of the ocean. The boat is quick to reach the reef, a characteristic appreciated by all. On top of it all, there are hot showers to welcome guests back on shore. Over all, it’s a fantastic day of snorkeling and fun. 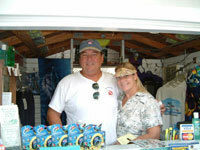 If you have any questions, please call Gerry and Kathie at Sundiver.